It’s hard to lead off the links with anything other than the resolution last week of one of the most interesting sporting events of the year, one full of surprises. I am, of course, talking about the England-India One-Day series which culminated in England absolutely hammering India through stylish batting and devilish legspin – a turn-up for the books if ever there was one. With Sri Lanka also doing their best impression of a competent cricket team, it’s been a pretty good week. How valuable – or costly – is having a ‘very stable genius’ in charge of your country? It’s hard to assess this kind of question, since we have only one of each country, and can’t exactly randomise the President (though the election in 2000 was pretty much a coin toss, given that the presidency was decided by the sturdiness of a few sheets of card in Florida). 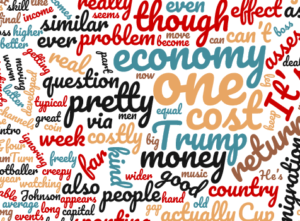 To get around that problem, and to estimate the Trump effect on the US economy, four researchers constructed a ‘synthetic US’ made up of a weighted average of similar economies, and assess how the real US economy has fared compared to the synthetic one since Trump was elected (a similar exercise for the UK finds our GDP 2% lower than it would have been but for you-know-what). They find … no effect. Trump has neither benefited nor cost the US economy anything so far, though to be fair, the results of his trade wars will take time to show. This shouldn’t surprise you – the US President has always had relatively little impact on the economy. Under normal circumstances, I’d be hesitant to try and sell you guys an increasingly techy blog about baseline surveys, but it’s really, really well-written. Alaka Holla opens with a tale of Catholic guilt and scavenged pencils in Haiti and somehow gets from there to a link to some Matlab code. More than that, though, she demonstrates how research is a series of choices and trade-offs under uncertainty, and how difficult it can be to know what the best option is. Sanjeev Gupta at CGD makes the obvious but extremely important point that simply raising tax revenues is not an outcome to celebrate if the proceeds are spent poorly. He focuses on the efficiency of spending, which is a clear margin for improvement, but there’s also a strong case that the choice of what to spend on is pretty shoddily structured in many developing (and developed) countries. “…it’s cost us life-changing amounts of money… It’s cost us take your hand off my leg, you creepy boss money. It’s cost us this relationship was fantastic when it started, but now you’re ignoring me money…” Women invest their savings at a far lower rate than men do. In a world where the returns to capital are higher than the returns to labour, this is a big deal – it means that the gender gap is built to keep getting wider, even as incomes become more equal. Planet Money investigate (transcript). It’s typical to ask why so many people migrate, even when it appears so costly; but actually, when you consider how large the returns to migration are, the real question is why so few do. Research into rural-urban migration in India suggests that part of the problem is informal social insurance – people can’t move freely when the only mitigation to income shocks that actually works depends on their presence. Interesting long read from the Guardian on Somaliland’s struggle to be recognised. And finally, the football-related marginalia: first, I ignored the World Cup final in the intro, but if you want to find a footballer who isn’t nauseating, N’Golo Kante seems like a good bet – this video of him being too shy to ask to hold the World Cup himself is kind of moving. Also an article from the Atlantic that channels Tim Harford’s book Messy to argue that less structure is better for football talent development, rather than more. And finally, I’m just old enough to have been introduced to basketball via Magic Johnson and football via Maradona; watching the latter warm up before a semi-final is one of the most amazing displays of sporting skill I’ve ever seen. Turn the sound up. He’s in rhythm with the music!